Installation view of Steven Pippin’s “End of Photography” at Gallery Side 2, with Out of Body Experience (2010) in foreground. All images: Photo ART iT. Inaugurating Gallery Side 2’s new space in a former drinks warehouse along a Roppongi backstreet, this exhibition of works by conceptual photographer Steven Pippin questions what would happen if a camera could document the very moment of its own death. 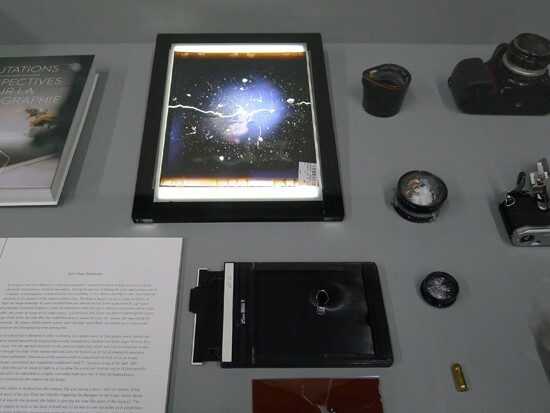 Using an exaggeratedly experimental set-up of various calibre guns, a high-speed flash and mirror panels, Pippin has made a series of photographs in which the circuitry of the flash triggered and shutter released by the firing of the gun allows a camera to witness the bullet passing through its casing – the last image it will ever record. 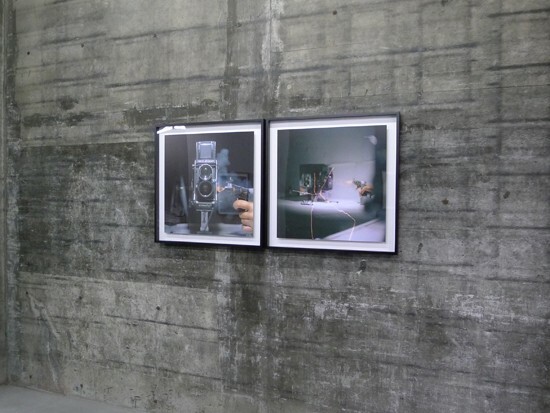 Two of these are on view at Side 2, where their clinical aesthetic smartly complements the untreated concrete walls. 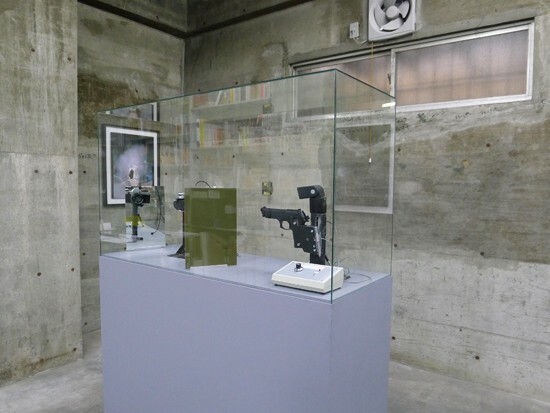 They are presented alongside a vitrine with an assortment of shattered camera remains and a second case with a recreation of the gun-camera circuit, as well as a group of quasi-abstract images made from exposing the film inside the cameras as the bullets pass through them. Given titles ranging from Mamiya 330 and 5 x 4 de Vere to Deep Field and Untitled [Black Hole], these latter works measure, through the patterns of shadows and textures of shattering parts that crackle their surfaces, the unimaginable but very real physical spaces inside the cameras themselves. Top: Installation view. Bottom: Detail of Work within a Work (2010). If there is already something uncanny about a camera taking a photo of itself, as though a device associated with objective observation is inherently governed by an injunction against self-regard (obviously not so for the people behind the cameras), then this sense is amplified and distorted by these fascinating, distracting and ultimately humorous images. Through the positioning of the mirrors in front and back of the camera, Pippin plays upon the photograph’s duality as both a means for technical analysis and a medium for illusory projection: we are always bracketed, it seems, by our reflections. As suggested by the title of the case with the gun-camera circuit, Out of Body Experience (2010), at stake here is the desire to see ourselves against the desire to represent ourselves, and the tenuous balance between objectivity and subjectivity. As well, in their fetishistic, forensic accounting of the trajectories of diverse elements in a shared environment at a given time – the coincidence of bullet, camera body, film, lens and control elements such as gun and mirrors – these works subtly ask: how do we account for the events of our lives, which at any moment can dissolve from recognizable forms into delirious abstractions?